Pressrelease from Hamabcher forest activists from September 5, 2018. 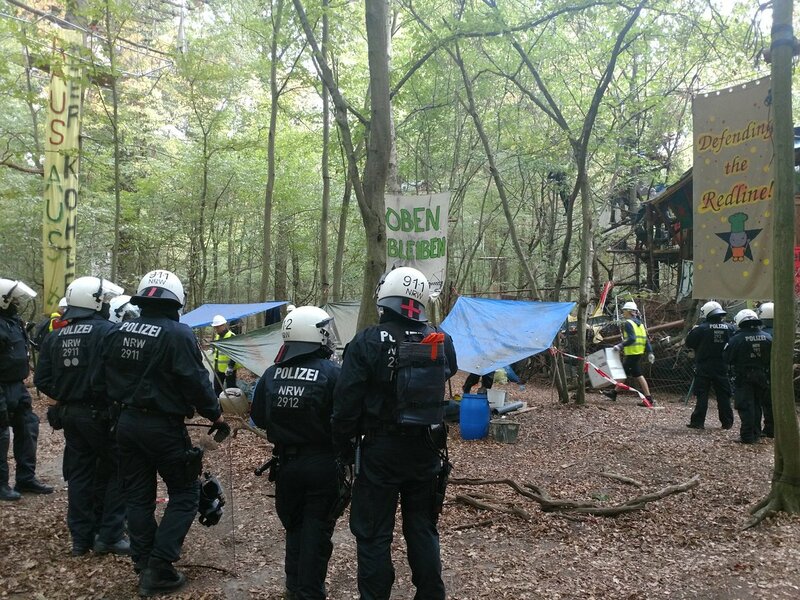 Since 7:30 AM (September 5) police officers of the German state, in cooperation with RWE employees, have been clearing ground structures and barricades in the occupied Hambach forest. Huts, shelters, and other necessary infrastructure (including compost-toilets and kitchens) have been destroyed all over the forest. In clearing the road for their machinery, the police evicted three occupied barricades; two tripods and a monopod. In order to protect the structure, an activist locked themselves on in a 2.5 meter deep tunnel below the tripod. Although they were equipped with a cherrypicker and several climbing-cops, the cops did not manage to fully evict the barricades before 17:20. This attack on the movement for climate-justice in the Rheinland marks one of the largest escalations from the German police in the struggle for the Hambach forest. While the police aggressively attacked the protest-camp, around 700 people attended a demonstration walking from the nearby city of Buir along the forest, protesting the dismantling of civil-rights and the clearing of the 12.000 year old forest, by fossil-fuel-giant RWE. The demonstration, a colourful group of people young and old, was escorted by a large amount of police officers, as well as cops on horses. The demonstration ended at the edge of the forest, and people could enter the forest unhindered. The frontlines have been clearly drawn, with the state fighting on the side of RWE and the coal-lobby, and activists fighting for the preservation of nature and climate justice. This day is only one of many more to come, and Day X seems to be coming closer every hour.